Insects are tiny creatures that can inflict pain, swelling, and other symptoms to an individual who has been stung. Sometimes the reaction is mild, but extreme cases of life-threatening situations do occur occasionally. 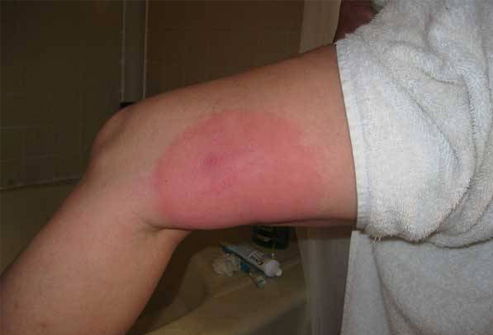 Insect bite identifications may be important in the treatment of symptoms especially if serious reactions occur. One can get a tick bite while outdoors, and it usually attaches to the skin as it brushes against plants or grass. 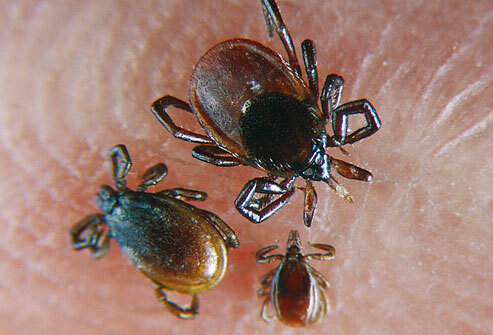 Most ticks do not carry disease, and most tick bites are not serious. 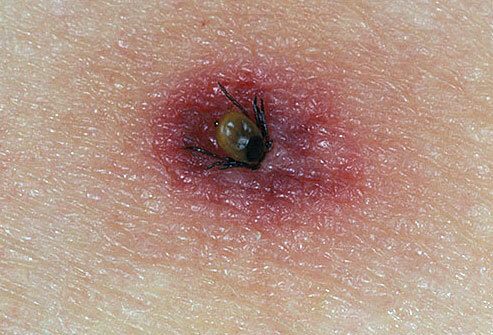 However, some may carry diseases like Lyme disease or Rocky Mountain spotted fever. Bites from ticks usually look bright red but are painless. The color may develop darker towards the center. If the head is not buried in the skin, remove the tick properly, using tweezers to pull the insect near its mouth, trying not to leave any part of the head or body on the skin. If the insect is found attached to the skin with its head buried in it, a lump may develop, and this may be the insect buried beneath the skin. In this case, do not attempt to pull the insect because the head may be left beneath the skin. Consult a physician immediately. If undetected and a rash forms after a few weeks, consult a doctor, as this may be a sign of a serious condition such as Lyme disease. Another type of insect bite idenfitication is spider bite. 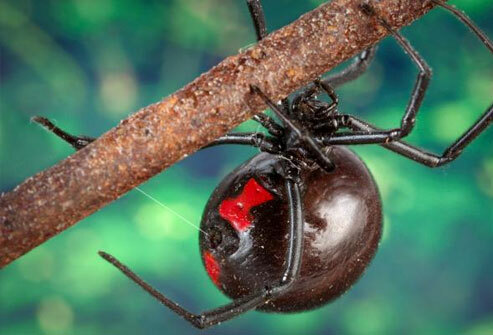 Bites from a black widow spider may be severe, since they can cause sharp pain, swelling, and redness. 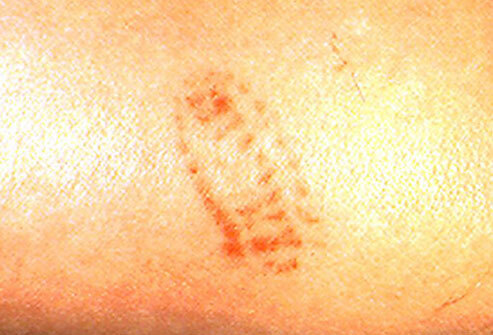 One may find one or two red fang marks on the skin and a nodule at the bitten site. Severe symptoms like nausea, vomiting, muscle cramps, seizures, and an increase in blood pressure may follow. Immediate medical care using anti-venom is needed. 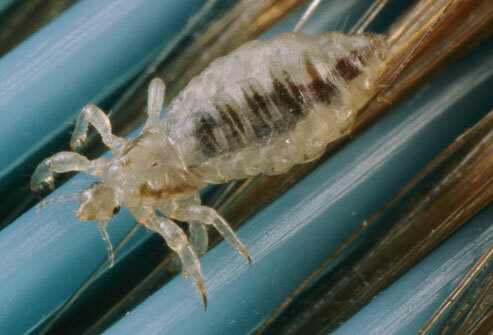 Lice are found in hair and they usually hide in the neck, scalp and behind the ears. 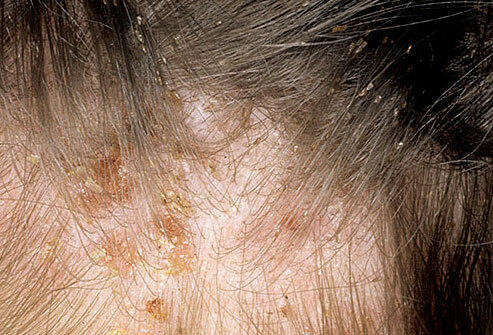 Symptoms include extreme itchiness of the scalp, which may lead to infection and hair fall. Kill the lice and their nits (eggs) using medically prescribed shampoo, creams, or lotions. Wash beddings, brushes, and clothes to prevent their spread and treat other contaminated household members. 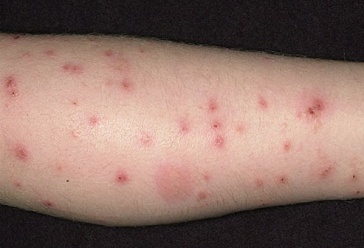 Bites from fleas produce red itchy bumps with a single puncture at the center. 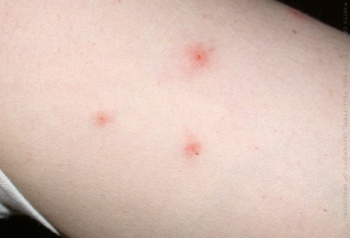 Bleeding small itchy bumps are seen as flea insect bite identification. The bites may be inflamed and appear in clusters. Some people are more sensitive to fleas and develop allergic reactions. The rashes may take several weeks to disappear. 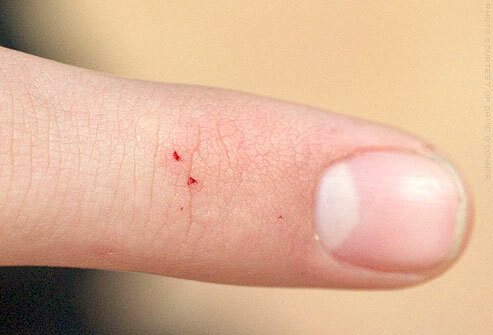 Scratching can lead to wounds or infection. 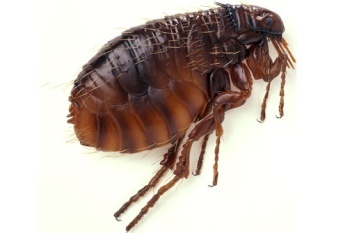 Get rid of pet fleas in your home by using insecticide sprays and vacuuming rugs. Treat your pets with flea shampoo and keep them out of the bed. 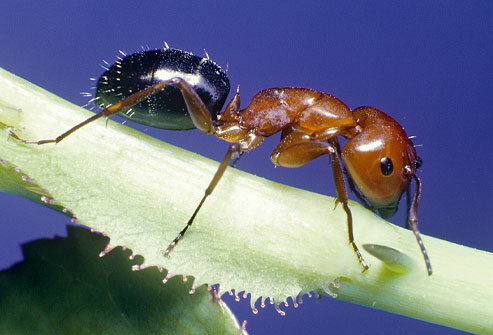 Fire ants are aggressive and latch to one's skin using their jaws. However, they sting from their abdomen and may inject venom to the skin many times. An ant sting produces red, itchy bumps that burn. After a while, the lesion may be filled with pus, accompanied by pain. 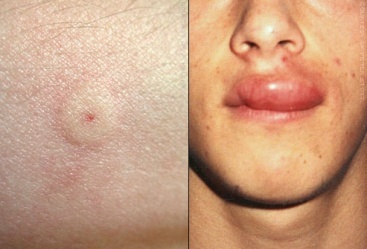 When bitten many times, a person may develop an allergic reaction that can be life-threatening. Immediate medical attention is required to control this reaction. 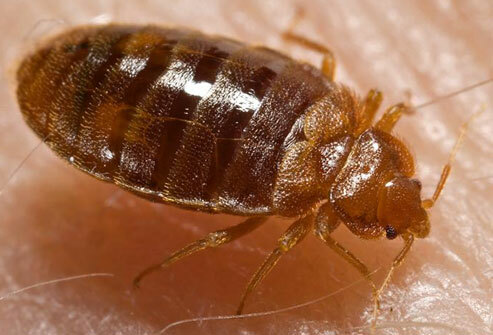 These insects often hide in beddings of hotels, apartment complexes, and shelters, and they can be brought into your home by clinging to your luggage, boxes and pets. Their bites cause itchy rashes, which may develop into bumps and blisters and become inflamed. The red bites may be found usually in the shoulders and arms and they can become infected when scratched. They may disappear within two days without treatment but one can use oral histamines or topical steroids to relieve an allergic reaction. Puss caterpillars are the most poisonous caterpillar in the U.S., found mostly in shady trees in Southern states. They emit poison from the hollow spines among their hairs. 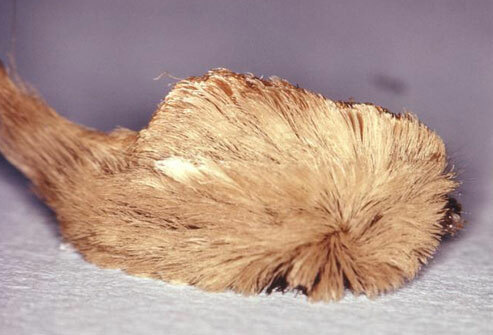 Upon contact with human skin, their hair injects the venom, which causes symptoms like itching, pain, and dermatitis. Some species may cause inflammation of the upper airway, leading to bronchospasm, vomiting, muscle cramping, bleeding, and in severe cases, kidney failure. When bitten by puss caterpillars, use a commercial facial peel or cellophane tape to remove broken-off spines and seek a medical professional. 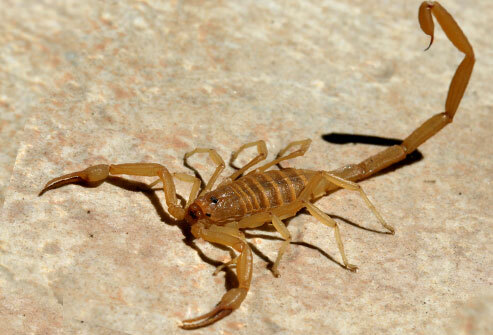 Not all kinds of scorpions are poisonous, but some can be deadly. These creatures are found mostly in Western and Southern states. Their sting can produce pain, itching, and swelling, and the skin can become red and warm. Other symptoms include tingling, muscle twitching, sweating, drooling, vomiting, drooling, vision problems, and abnormal head and neck movements. These may be insect bite identification, and one should get immediate medical help. There are many types of mosquitoes, and some are just annoying while others can carry viruses like the West Nile virus or dengue fever virus that can cause serious disease. 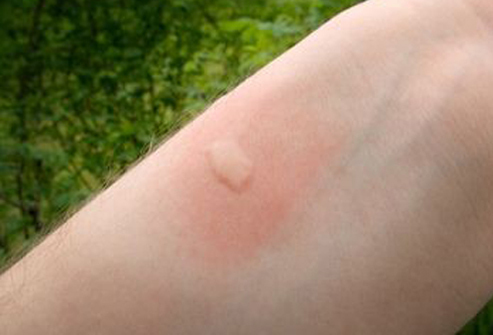 A mosquito bite can cause an itchy red blister, which may disappear without treatment. However, scratching can cause infection, and if a skin rash develops, an allergic reaction may have occurred. 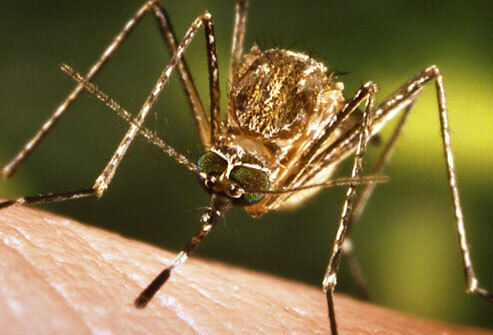 One can use insect repellents and window screens as protection against mosquito bites. If fever develops within a few days, medical consultation is needed. Bees usually attack to defend themselves. 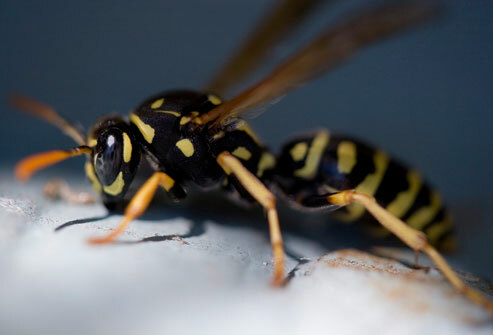 Certain types of bees lose their stinger after they bite but hornets, wasps, and yellow jackets could inflict several stings without losing their stingers. A bee sting causes immediate pain and swelling, and the skin becomes warm and itchy. Bacterial infection can occur. Symptoms of bee sting allergy include hives, swelling of face, mouth and throat, vomiting, wheezing, chest pain, and decreased blood pressure. If bitten by a bee, simply remove the stinger from the skin, clean the site, and apply ice. You can also take and oral antihistamine for itching, and acetaminophen or ibuprofen for pain relief. In case of severe anaphylactic reaction, call for emergency care or use epinephrine (EpiPen) if you have one. Do not provoke insects, because they may turn on you and attack. Avoid making rapid or jerking movements near insect nests. Avoid wearing floral-patterns, dark clothing, or perfume. Use protective clothing and insect repellants outdoors. Sweetened beverages and garbage cans attract bees and other insects, so use caution when eating outdoors. People who are known to have a serious allergic reaction to insect bites or stings are advised to wear a medical ID or bracelet and to carry an emergency epinephrine kit. Family members and friends must learn how to use it to help you if you have a reaction.